The US denied a report saying Tillerson opted not to have dinner with his South Korean counterparts on a diplomatic visit because of fatigue. SEOUL: The United States on Saturday denied a report saying Secretary of State Rex Tillerson opted not to have dinner with his South Korean counterparts on a diplomatic visit because of "fatigue". Tillerson visited Seoul Friday on his first tour of the flashpoint region, where he warned military action against nuclear-armed North Korea was an option if the threat from the regime escalates, in what appeared to mark a major policy shift. The Korea Herald reported that Tillerson had "shortened diplomatic consultations and public events in Seoul". It added that his meetings with Foreign Minister Yun Byung-Se and Acting President Hwang Kyo-Ahn had been brief compared to those with Japanese officials on the previous leg of the tour. "Seoul officials said the US side opted not to have a meal together, citing the secretary’s 'fatigue'," the report said. However a US embassy official in Seoul on Saturday dismissed the account as "incorrect", saying: "There was no dinner planned". 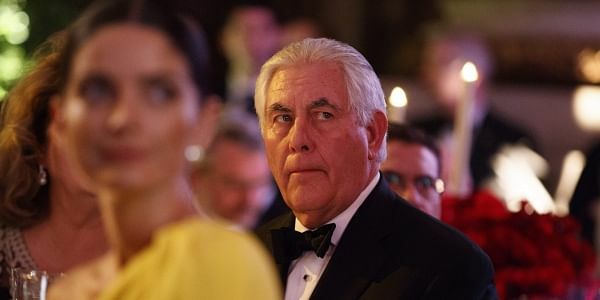 "He had a private dinner and he had no official dinner planned," the official told AFP, adding that Tillerson had held "substantive" talks with Hwang and Yun. South Korea's conservative Dong-A Ilbo daily quoted an unidentified South Korean foreign ministry official as saying that the Seoul visit was a short working trip and that "diplomatic meals are not essential" on such visits. But the centre-right JoongAng Ilbo daily said Tillerson might have found it unnecessary to dine with officials from the outgoing government of impeached ex-President Park Geun-Hye ahead of fresh elections in May. Tillerson broke with decades of tradition by opting not to take any accredited reporters with him on the Asia trip apart from one journalist from a conservative publication. The former ExxonMobil CEO had until now kept a very low profile since taking up his position on February 2, speaking in public only a handful of times and not holding a single news conference in the US. Tillerson, who Saturday flew to Beijing, spent 24 hours in South Korea to discuss the North, which carried out a missile test last week, that Pyongyang described as a drill for an attack on US bases in Japan.